An upper middle-income country, Botswana has enjoyed a stable political environment and rapid economic growth. It is a young nation with a third of the population aged 10 to 29. 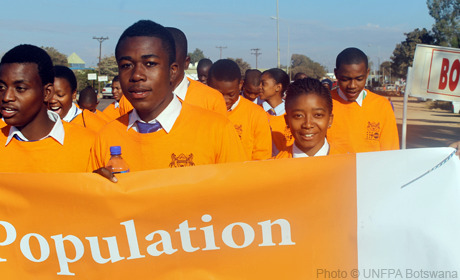 UNFPA support today focuses on sexual and reproductive health and on the needs of young people. Priorities include providing quality reproductive health services, and improving programming for sexual and reproductive health services to adolescents and young people. UNFPA works closely with its partners to advance gender equality and prevent gender-based violence, advocate for scaled up youth friendly services and HIV prevention, and ensure the availability of quality disaggregated data. GHANZI, Botswana – Two years ago, 12-year-old Xhute could not afford shoes to wear to class.